Watch our recordings today of previous deliveries in this series to take advantage of content that has been created specifically for health leaders in Ontario! ​​Cross-sector collaboration is a major goal of the LeaderShift project. But how can we collaborate when we don’t really know what other parts of the community and primary health care sector are doing? 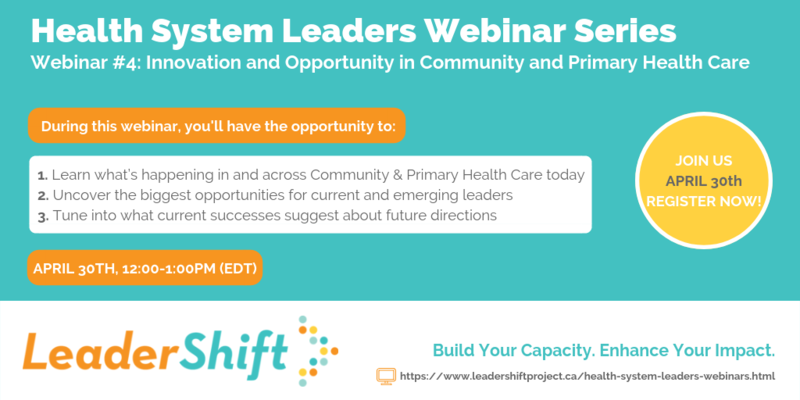 Tune into what’s happening in and across community & primary health today and uncover where the biggest opportunities for current and emerging leaders lie in this upcoming webinar. ​Seats are limited for live participation. ​​REGISTER NOW to participate live in the final installment in this dynamic series! ​​Building off of webinar one, webinar two will deliver an interactive discussion about where Ontario's health system is going, the factors driving healthcare reform, and how your sector can navigate and be at the forefront of change. Attendees will come away with a more in-depth understanding of how policy and politics intersect and the implications and opportunities for their sector. Once again, we have modified this content into three slightly different versions of the same webinar, based on the sub-sectors below. as well as civil service), this webinar includes discussion of other key relationships for providers including LHINs, the Council on Improving Healthcare and Ending Hallway Medicine, other ministries, municipalities and other funders, and on how these may be shifting under the new government.